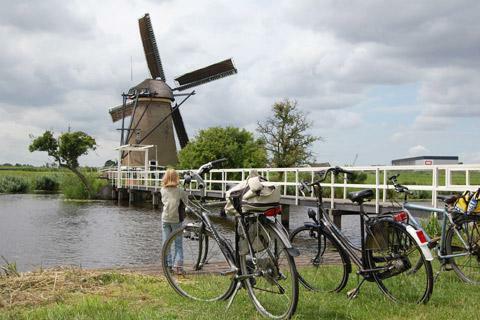 The delightful towns you will visit on this bicycle holiday are Utrecht, Gouda, Den Haag, Delft, Schiedam, Rotterdam, Dordrecht, Woudrichem and Gorinchem. In the beautiful town of Delft, find out what links Delft to world famous painter Johannes Vermeer (1632-1675); or go and see how Delft Blue ceramics are made. You’ll visit Gouda’s pleasant town centre, relatively untouched by time, known for its cheese market, candle making, the fairytale town hall and the attractive canals. The route leads you to see many things unique and remarkable such as Old Dutch fishing village Schiedam which boasts the highest traditional windmills in the world. They mill grain for malt wine for the jenever distilleries. Truly unforgettable, moreover, are the nineteen windmills in the polder at Kinderdijk. As on all our carefree cycle tours, we provide luggage transfer and excellent accommodation.